This is the latest in an ongoing series of property advice articles from Nigel Salmon M.D. of Girasol Homes. Now in December and the New Year is looming. Maybe your property has been on the market for a little while but don’t worry, after the Christmas lull there’s always a bump in sales in January as buyer enthusiasm rises again. Here are 8 top tips from us at Girasol Homes to help you take full advantage of that upswing. 1. Inside presentation – Buyers make decisions based on what they see. If you partied hard over the holiday period then tidy up and make good any overenthusiastic dings and dents. If the place was shut up during December then air it out and give it a clean; especially the windows, not being able to see the view is a real turn-off. 2. Outside – Similarly, make sure the outside of your property is looking at its best. Clean the shutters, maybe consider a fresh coat of paint to freshen the walls. If you have a garden, arrange for a little TLC; trimming, weeding and ensure the irrigation system is working (change the batteries in the timer!) If the gardens are communal and they’re showing some mid-Winter shabbiness, try lobbying the gardener or community manager. Likewise, if you have a pool, make sure it’s clean and clear – green and murky can be a dealbreaker. 3. 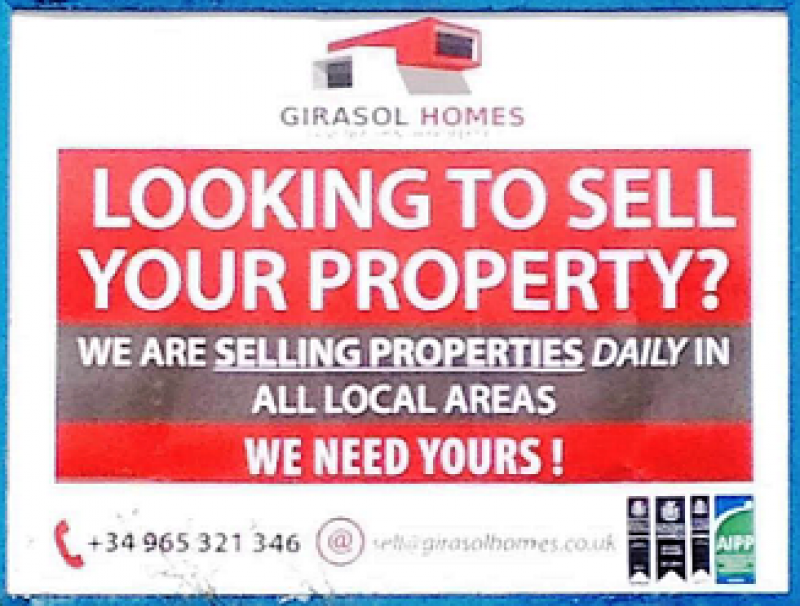 For Sale board – Put simply, get one, you’d be surprised how many enquiries we get based on someone walking past and seeing the board. Or, if you have one already, make sure it’s clean and fixed straight. 4. New pictures – A good strategy is to give the impression that your property is a ‘new instruction’, i.e. it hasn’t been for sale long. That’s why a clean For Sale board is a good idea. Another tactic is to use a fresh set of pictures for your advertising. 5. New agents? – Depending on how the selling process has been going so far, you may even look into changing agents (or appointing a second agent, assuming you’ve not signed an exclusive contract with the first one). That’s another good way to make your property look fresh on the market. Just remember to look for one that’s a member of the Association of International Property Professionals. (See last month’s article: “7 Points to Bear in Mind When Choosing a Property Company”). 6. Let someone else host viewings – While we’re on the subject of agents, whether you switch or stick, let them show prospective buyers around your property. Yes, you may be very house-proud but experience shows that buyers are more comfortable (and more likely to buy) when dealing with a more neutral ‘host’. Have yourself a coffee or a caña and leave it to the professionals – that’s what you’re paying them for, after all. 8. Price – I won’t labour the point, but if the property hasn’t attracted the interest you were hoping for, it may be time to discuss pricing with your agent. Any agent worth his or her salt will be happy to give you the benefit of their experience and have a frank chat about valuation. Finally, bearing in mind the current post-Brexit ups and downs, remember to take into account foreign exchange rates if re-pricing your property. business in Spain and how it is likely to change in the future.